With a Sunesta Power Awning installed at your home in California, you will be able to enjoy the sun when you want it and the shade when you need it. With the simple push of a button, you can extend your power awning to block out the sun, and then retract it to enjoy the sunshine or a clear view of the night sky. There are plenty of other reasons why homeowners in California love Sunesta’s awnings. For example, our fabric selection has more than 150 styles to choose from, making it possible to find just the right aesthetic to match or complement your home. 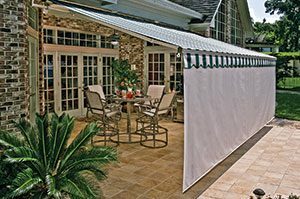 Additionally, our awning fabric is woven from 100 percent solution-dyed synthetic fiber, so it is colorfast, mildew resistant, easy to clean, and long lasting. Every Sunesta Power Awning also has its own SmartCode‚Ñ¢. This is a unique number that we can use to identify your order and provide personalized assistance should it ever be needed down the road. If you are interested in having a power awning installed at your home in California, call 1-800-SUNESTA today. One of our knowledgeable representatives will be glad to assist you.